Preparation Time: 20 minutes to cut the vegetables, boil the corn and shredding cheese. Add another 5 minutes to make the pizza toppings ready to be baked. To start the preparation I first chopped capsicum and onions into small pieces, then grated cheese, boiled corn in pressure cooker and left it to cool by draining off the water. In a bowl put tomato ketchup and pasta & pizza sauce and mix them well. 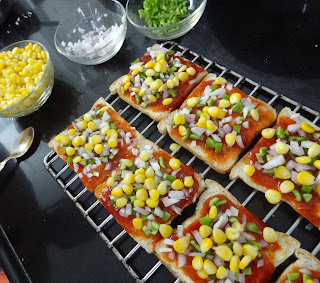 Spread butter and the mixed sauce on the bread slices to form the pizza base. It is ready to be baked. In the oven set the temperature to 2000 C and place the slices in it. Remove it once the cheese melts.